The addition of salt-cure lemons to this recipe really brings it to life. Although it is very good without them, the lemons make you stop and think, “Wow. What was that?” Don’t add extra salt to the salad without tasting, however. The briny cured lemons are very intense on their own, but season a larger dish like this perfectly. You can make this recipe a day or two ahead and store in the refrigerator, so it’s perfect for taking to summer gatherings. In a glass bowl, combine yogurt, garlic, olive oil, lemon juice, and zest with a fork or whisk. Season with salt and pepper to taste. Place broccoli florets into a microwave safe bowl with 1 T. water, cover and microwave until slightly tender, about 4 or 5 minutes. Microwave times vary, so check after 3 minutes and adjust time accordingly. Set aside to cool completely. 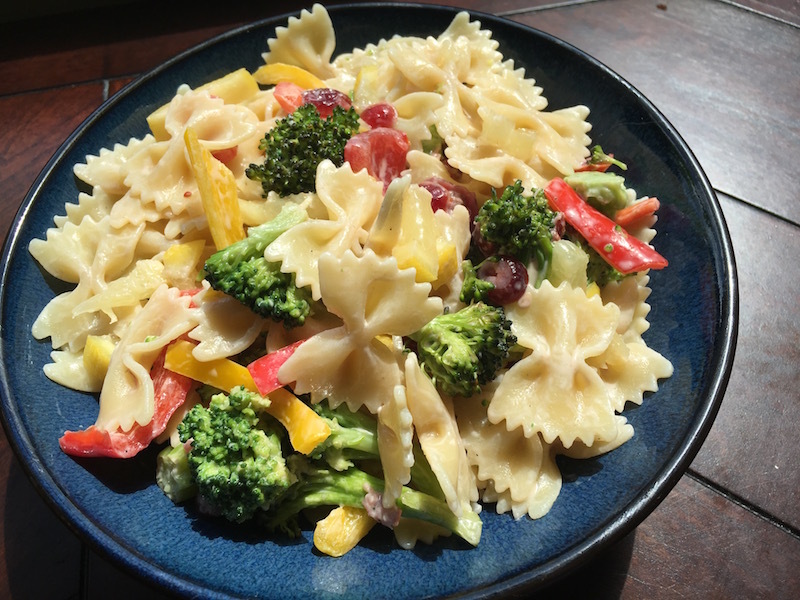 In a large bowl, combine cooked pasta, steamed broccoli, red and yellow pepper, cured lemon and cranberries. Toss to mix well. Add some yogurt dressing and toss again until thoroughly combined and serve.